Thanks all who attended the event (personally or online). 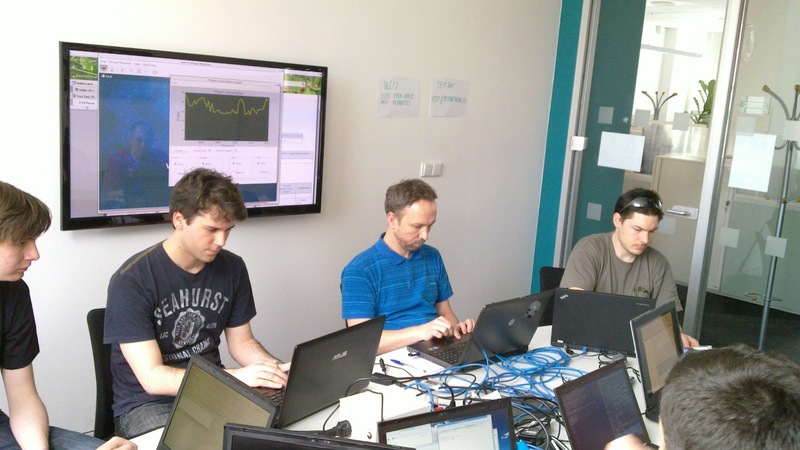 There were about 40 visitors during the day in our "test room" in Brno office and it was really great to meet there. The demand was more than the available room could handle :) and we are sorry for the limited number of seats. Most of the visitors helped us with the testing and went through the prepared test cases. As a thank you they got a small gift from us. 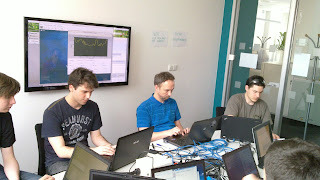 On the attached picture you can see testers in action :). Notice the graph on the TV in the background - everybody who connected her/his machine to our measurement equipment was able to see it's power consumption in the real time on that TV. As the proof that Fedora is ARM friendly, we had there Cubieboard, of course running Fedora 19 :) Later in the day we used it for the real time power consumption graphing, replacing the dedicated PC and saving a lot of energy :). Few visitors were interested in Fedora 19 in general. That wasn't problem, because we had there spare laptops with Fedora 19 pre-release installation, so they could freely try it and ask questions. We also ran the test day online and provided guidance on the #fedora-test-day Freenode IRC channel. We did our best, but sometimes it was really hard to handle it all, so we are very sorry if you experienced increased latency in our IRC responses. So far many of the testers have already submitted their results. Such feedback is very valuable for us. If you missed the event, you can still participate online, just follow the instructions on the test day wiki http://fedoraproject.org/wiki/Test_Day:2013-04-17_Power_Management. And of course don't forget to submit your results :). We plan to release the detailed stats later (it will be calculated from the data submitted till 2013-04-28). Anyway, the generic distro kernel from F19 doesn't work because a lot of patches are not yet upstream. You need to use "old" cubieboard specific kernel. Ok thanks again, I will try it soon.